A um quarto romântico get distância a apenas 50 minutos da LSU em Baton Rouge. Esta velha cabana cem anos estilo Acadian tem todas as conveniências de conforto moderno. A cabine de quatro quarto está equipado com uma moderna cozinha completa com forno de microondas, fogão elétrico, geladeira / freezer, máquina de lavar louça e. O quarto e área de banho são quaintly mobiliados com cama queen size cabeceira de metal e uma banheira clawfoot antigo. We rented the cabin for a weekend of rest and relaxation. The cabin and scenery were exactly what we were looking for. The owners were also amazing! Will definitely book again. It was located perfectly for us to take the kids around to see the bayou country and get to New Orleans for a quick trip. It was also so relaxing to just sit on the porch and enjoy quiet sounds of the country. My wife and I visited New Orleans 25 years ago on our honeymoon and returned there for our silver anniversary. In addition to returning to one of our favorite cities, we planned a trip to "Cajun Country" to see what the bayou is all about. We had no idea to where to stay or where to go but when I saw a picture of Julie and Keith Landry's cabin online, it became our focal point. And it turned out to be pretty close to New Orleans. After five days in the city, moving into a rustic cabin was the perfect way to cap our vacation. We had dinners on the front porch watching the sunset (the wooden rocking chairs are awesome!) and I would sneak out back to pet the horse and pony nearby (never got their names). We are small town people and it was nice to hang out in another small town - Napoleanville. The highlight of our trip was touring the bayou with David Gros. David picked us up at the cabin at 5:45 a.m. and we were out on the water by sunrise. As we meandered through the rivers and lakes and canals, gawking at the wildlife, David told us stories of growing up on the bayou, stopping occasionally to meet some locals - Mr. Leroy, Mr. Adam, Miss Wanda. For us Northerners, it was total immersion into another culture and way of life. Superb. There is much to recommend about staying here. Our excellent, caring hosts, its historical significance, its proximity to Baton Rouge, the River and New Orleans and its rural character. This is not a "touristy" area, which is why we liked it so much. Thank you Julie and Keith! This cabin is simply amazing! You'll be taken back in time when you enter the doors! From floors to ceilings the entire cabin is stunning. Although it's tucked away in the beautiful country, it's still close enough to travel to all the local attractions. You won't regret your stay at Four Cypress Acadian Cabin! My wife and I were fortunate to have spent a month here, from mid-February to mid-March. We had wanted someplace peaceful and quiet, but also located within easy reach of New Orleans, where we have friends and Cajun country. This was kind of a perfect choice, in that regard. There's also a couple of good restaurants nearby and chain outlets about 25 minutes away. But the real reason to come is to inhabit this eclectic, lovingly decorated cabin. All the times we were inside, we still realized we were in an exotic location for us Mainers. There are also rocking chairs and porch swings if you just wan't to relax in the Louisiana sunlight. Highly recommended! 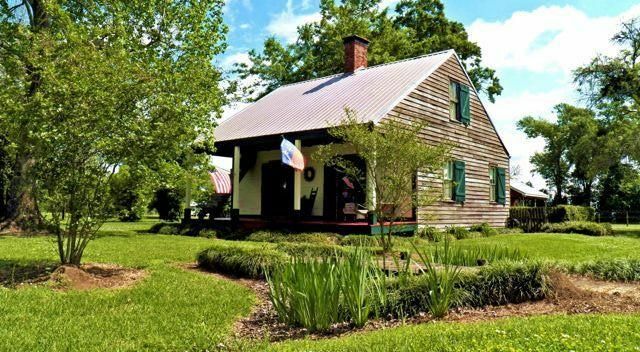 Quatro Cypress Acadian Cabin tem uma localização central no coração de 'país Cajun' do Sudeste Louisiana. Somos uma hora ao sul de Baton Rouge, uma hora a leste de Nova Orleans, e uma hora ao norte de Houma Louisiana. A velha cabana estilo Acadian cem anos está localizado na histórica Bayou Lafourche, no meio do país cana. Estamos dentro de uma unidade de 45 minutos de várias casas de fazenda famosos; Oak Alley, Nottoway, Laura Plantation e Madewood. Quatro Cypress está a 10 minutos de carro do Lago Verret, uma pesca e de recreio lago cercado por árvores de cipreste calvo e formação de equipes com bela Louisiana sul vida selvagem. Swamp tours e passeios guiados pesca pode ser arranjado. Monthly guests will also be assessed a weekly cleaning fee of $85.00.